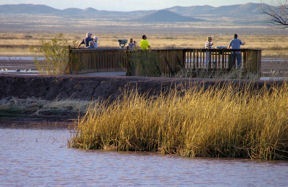 Arizona attracts a multitude of bird watchers – novices to fanatics. Cochise County in the southeast corner of the state is especially rich in avian habitat: riparian zones, sky islands, canyons and playas. Some years ago we stopped into the visitor center in Willcox, AZ during a February trip. I overheard a staff member describing the Whitewater Draw Wildlife Area near McNeal. 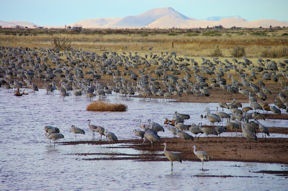 “Last week when they did a count there were over 11,000 Sandhill Cranes and 2,000 Snow Geese. The hour before sunset is a great time to see them fly in after a day of field feeding.” We added Whitewater Draw to our afternoon agenda – and have returned every year we’re in the area. When we arrive at Whitewater draw we spot only a few cranes pecking around corn stubble in a nearby field or standing one-legged in shallow water. Armed with binoculars and cameras we follow the trail around Cattail Pond to one of the viewing platforms. We hear rumbling “swish, swish, swish” several seconds before spotting a dark, airborne wave approaching from the north. Soon we can distinguish literally hundreds of wings seeming to flap in unison. With wingspans in excess of six-feet a lot of air is displaced with each downbeat. After a couple of slow circles the Sandhill Cranes glide in for a landing, line after line resembling a well choreographed dance. The water seems to fill as the next wave circles. 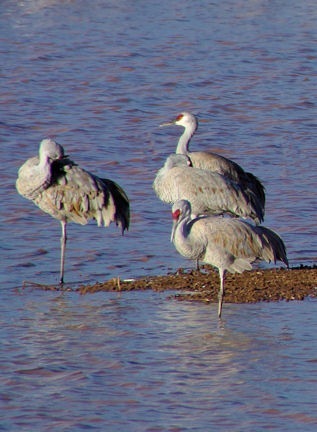 Sandhills stand more than three feet tall, their gray plumage tinged with shades of russet. We admire the long graceful necks and distinctive red forehead patch. Honking announces a V-formation of Snow Geese high overhead. On land or water they appear all white but their black tipped wings are evident in flight. The geese settle in among the cranes, neither perplexed by the other. As the last stragglers arrive we watch cranes and geese settle in for the night. Some flit from group to group – must we the teens – while most fold one leg up into their breast feathers and “crane” necks 180-degrees to bury heads into thick back plumage. It’s time we leave our amazing nature experience. 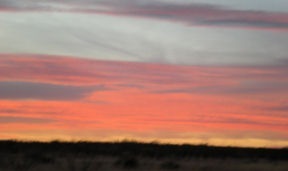 As we drive the rural roads headed to Benson for food and lodging we bask in one more phenomenon – an Arizona sunset.